Finding plus size dresses has long been one of my most difficult shopping ventures. There's no shortage of wrap dresses in muted colors or $19 mesh randomness but, like most gals I need my clothes to reflect my personality and that's just not me. One of most important things that I look for in a dress, especially something that is more of an investment piece, is versatility. I love pieces that can be worn to a meeting, a work event, a party and now that spring is here...weddings etc. This little gold and black number is from my gal pal Melissa Masse. My favorite thing about this brand is that every piece in the collection comes in size XS-3X. It's not a straight size brand that offers a few pieces in plus, it's just a great collection of pieces for all women. How much do we love that?! 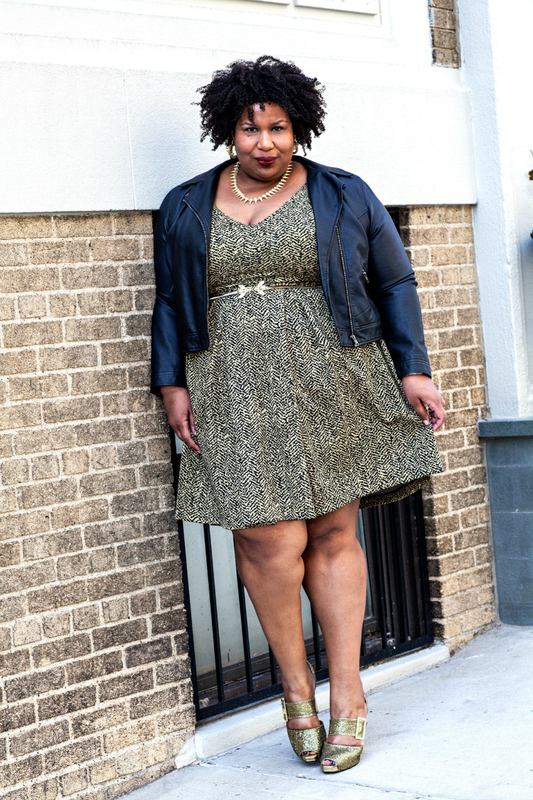 Adding my leather jacket and really leaning in with more gold (jewelry and shoes) is obviously more of a party or even date look but I could totally switch up the accessories add a blazer and this dress is perfect for a lunch meeting etc. etc. This particular dress isn't available to purchase until later in the year but lots of other fab options here!